The perfect human physique: toned stomach, bulging muscles, six pack. That’s the body we all want, but many of us don’t have it. “I love food too much to go on a diet." "
My schedule is too packed with work, kids, errands to find time to exercise." Does this all sound too familiar to you? There are many excuses we give to excuse our current shape. Mankind has never seen food this easily accessible as it is today. Our ancestors never had supermarkets, refrigerators or food available all-year round. A perilous four-hour hunting session can now be satisfied with a cup and two minutes in a microwave. Many of us now eat the conventional three meals daily – breakfast, lunch, dinner. We often treat ourselves with snacks in-between – chocolate, crisps, dessert. All of these high-caloric, low nutritional value “snacks” add up. There’s no wonder why society is becoming more obese, with diabetes, heart disease, and cancer becoming increasingly prominent in today's age. Many fad diets have been made popular in recent history, most of which resulted in excellent results early on, but was difficult to maintain, resulting in a rebound gain in weight – often worse than before. The biggest obstacle of a diet is changing your eating behaviour. If you are unhappy with your physical self, you need to change the way you eat, and it must be easy enough to maintain. There are many paths to becoming healthy and achieving the coveted peak of the human physique. In this article, we will introduce a simple "diet plan" that can be easily implemented into your day-to-day schedule – intermittent fasting (IF). What makes this “diet” so easy? Firstly, there is no strict “cannot eat sugar/fast food” rules. We all have that one comfort food we cannot live or function without – coffee, cake, chocolate (dark chocolate is my weakness). Cutting out certain favourite foods forever is a lot tougher than waiting 6 hours. Secondly, this does not require you to make time in your schedule to achieve. Many diets require you to plan and cook healthy meals. The time required to plan, shop, cook and clean would crowd your already busy schedule. Maintaining this new lifestyle would be difficult for many. With intermittent fasting, typically one will lose weight and body fat without consciously reducing or meticulously counting calorie intake. On a side note, regular physical exercise is strongly recommended, if you do not exercise already. Research shows that intermittent fasting alone will give you good results, but best results are seen when combined with regular physical activity. See tips concerning intermittent fasting and exercise below. Intermittent fasting is an eating pattern where one consciously cycles between the “hungry” fasted state and “eating” fed state. You do not need to avoid any particular food; rather, you avoid eating over a period of time. There are two common protocols: 16:8 and 5:2. 16:8 will be explored in further detail as it is the easiest to implement (5:2 involves eating whatever you want five days a week and eating next to nothing for two). This protocol involves fasting for 16 hours and eating in 8-hour blocks per 24-hour day. This can be achieved by changing your eating schedule. Fasting for 16 hours may sound daunting at first, but if you consider the fasting during 8 hours of sleep and skipping breakfast (which most people do), it becomes much more sustainable. 5 Health benefits of intermittent fasting? Eating less frequently reduces insulin and increases growth hormone levels, both in turn stimulates the release of norepinephrine. This creates a fat-burning environment, increasing your metabolic rate by 3.6-14% (1,2). A review study from 2014 showed weight loss of 3-8% over a 3-24 week period and 4-7% reduction in waist circumference. Compared to other diet studies, this is significant weight loss and reduction of visceral (belly) fat surrounding organs causing disease (3). Lower insulin levels induce the release of stored fat into the bloodstream. This creates an easier access to burn for energy (lipolysis). Glucose is the body’s first energy source to be burnt for fuel. The standard diet is high in carbs, which releases high levels of carbohydrates. Excess glucose gets stored as glycogen in our cells and muscles. When you restrict the intake of carbohydrates, the body will resort to burning protein and fat deposits for a source of energy. This results in excess fat cells reducing in size. The reduction of fat cell size results in increased insulin sensitivity (Diabetes Mellitus type II is too much glucose in the blood due to insulin insensitivity) (4,5,6). Human growth hormone increases as much as 5-fold. This increases the release of norepinephrine producing increased energy output, leading to potential enhanced fat loss and muscle gain (7,8). #2 Intermittent fasting can reduce insulin resistance – the most common cause of Diabetes Mellitus Type II. Studies show blood sugar reduced by 3-6% and fasting insulin levels reduced by 20-31% (9). #3 Intermittent fasting controls blood lipids, especially LDL’s (low-density lipoprotein - the bad type). Excessive LDL in the blood forms plaques, increasing blood pressure, clogged arteries (atherosclerosis), risk of heart attacks and strokes (10). #4 Animal studies have shown intermittent fasting reduces cancer risk by inhibiting tumour growth and progression. Cancer is a cell growth formed by accelerated cell division that thrives excessively in a high sugar environment. In a fasted state, there is less glucose (sugar) available in the blood, reducing the food supply required by cancerous cells (11,12,13,14). #5 Intermittent fasting helps you live longer. Studies have shown rats that fasted live 36-83% longer than well-fed counterparts (15). The same has been found in other animals, including roundworms and monkeys (16). During the fasting state, the short-term stress on the body leads to an adaption to become more energy efficient, extending one’s life. Furthermore, during a fasted state, cells are able to initiate a process of cellular repair known as autophagy (Greek for automatically eat). This is where the cell will digest damaged proteins within cells, allowing for new stronger healthy proteins to be built in its place (17,18). Aside from the above mentioned mechanisms and studies, intermittent fasting is also proven to boost gene correction and help reduce shortening of telomeres. With intermittent fasting your genes become healthier, cells replicate better, which means you will look younger and live longer! Q: I thought we’re supposed to eat many small meals? A: The research behind this shows that your metabolism rises with each meal because energy is required to break down consumed food before absorption takes place. The metabolism rate is raised for a few hours post-meal, thus burning more energy. More research has come out since then showing the increased energy burning throughout the day from 5 small meals is minimal compared to those who eat the standard 3 standard meals. Outside of research, human behaviour and social constructs make 5 small meals difficult to maintain. Humans are social creatures. Although everyone is different, the large majority of people will eat together over dinner. Below is a 5 small meal diet where the amount of required calories is distributed equally in multiple meals. IDEAL calorie distribution if you wish to implement 5 meal diet. common mistakes / flaws of calorie distribution in real-world setting of 5 meal diet plan. If you were to eat with friends, had an event (eg. Birthday) or travel, it would create an imbalance in calories. Especially when one considers a hearty dinner coupled with an energy dense meal like dessert. Although many call this a “cheat day”, if you are starting the diet for the first time (or attempting to start a diet for the third or fourth time), you may fall into the pattern of having multiple “cheat days” in a week, creating a muffin top effect. The best way to see results is through consistency and some willpower. This is where intermittent fasting shines. The eight-hour window can be changed to include such events (most commonly lunch and dinner). Skipping breakfast would reduce the total amount of calories taken in a day, and the extended fasting state would start “fat burning” (12-16 hours of fasting). Choosing to say no to breakfast and waiting a few more hours before eating is a lot easier than saying no to cake, or choosing an entrée at a dinner table full of mains. Q: Will I lose muscle mass during IF? A: This study shows that intermittent fasting results in less muscle mass loss compared to standard diets. If you are working out on a regular basis, consuming BCAA’s before workouts would help to replenish proteins in your bloodstream and muscles. Q: What happens if I miss the eating window? A: The beauty about this type of diet is you can eat anything you want – in moderation. There are no strict "no sugar, gluten-free, paleo" rules. BUT the power in this is in the extended fasting state. 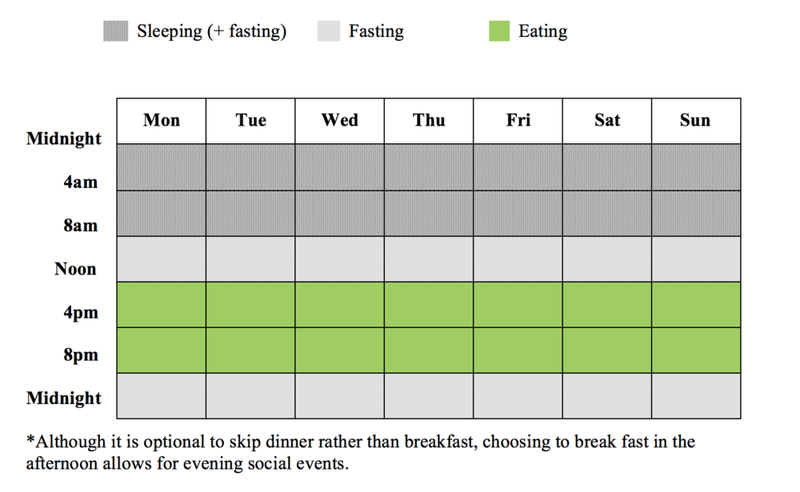 Your chosen eating schedule should be strict, and no calories should be consumed during the fasting state. The "fat burning" process begins 12-16 hours into the fast, but if you do not exercise on a regular basis, may take 16-24 hours before the accelerated fat burning begins. We recommend everyone to exercise on a regular basis for general health benefits, with or without fasting. Q: What can I consume during the fasting window?